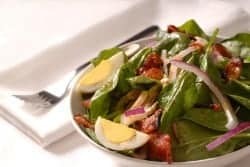 Home » Copycat Restaurant Recipes » Bennigan’s Hot Bacon Dressing – goes so well over fresh baby spinach and other greens. Bennigan’s Hot Bacon Dressing – goes so well over fresh baby spinach and other greens. Hot bacon dressing is a real treat. If you have never had Hot bacon dressing you have been missing out on something incredible. You can make this recipe up easily at home, and enjoy this salad anytime. While there may not be many Bennigan’s around anymore, you can have a salad that tastes just like theirs. Make Bennigan's Hot Bacon dressing at home. Dijon mustard to the onions and stir together with a rubber spatula. Add the water, vinegar, pepper, honey, and cornstarch to the mustard and onions and mix. Continue stirring until mixture thickens and comes to a boil. Remove from heat and store in the refrigerator until needed. Makes 1 quart. Note: To reheat use a double boiler. I put Tabasco on the ingredient list if you like it. In different parts of the country, Bennigan's omits this ingredient.